Yet another very early morning shot with the full moon lighting up the landscape. A frozen pond reflects window light on its icy surface at this old mill. This is yet another image of the mill as work goes on throughout the day. 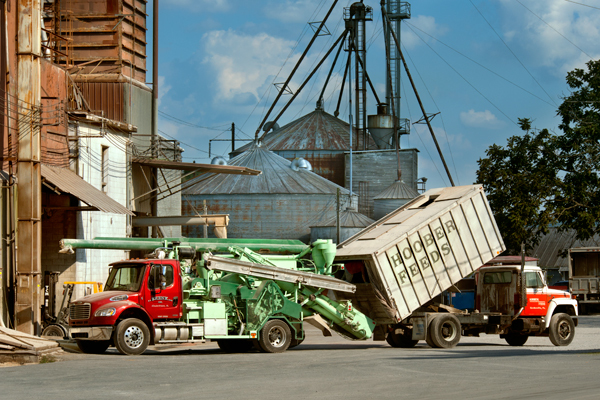 I was told the truck on the left is called a hammer mill, which as I understand things,mixes the various feed components on site for farmers. The sun came out briefly to illuminate the trucks while the grain silos remain in shade. Have you ever seen so many cobwebs,you thought you were on the set of some science fiction thriller? 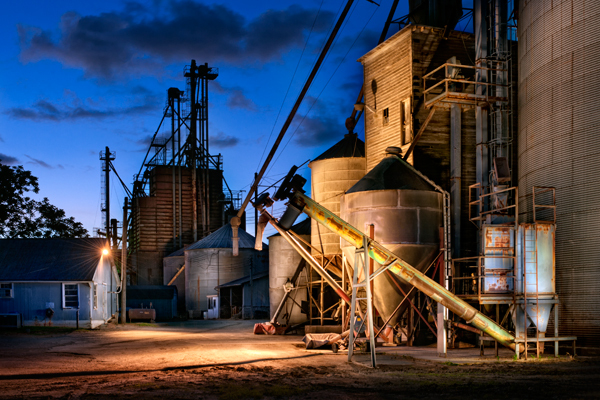 Well this was the case as both myself and a fellow photographer spent an evening shooting in a local feed mill. I walked around looking for a shot and came across this corner of the mill that seemed lost in time. It’s no wonder spiders have laid claim to this place as flies were a real nuisance while we shot. 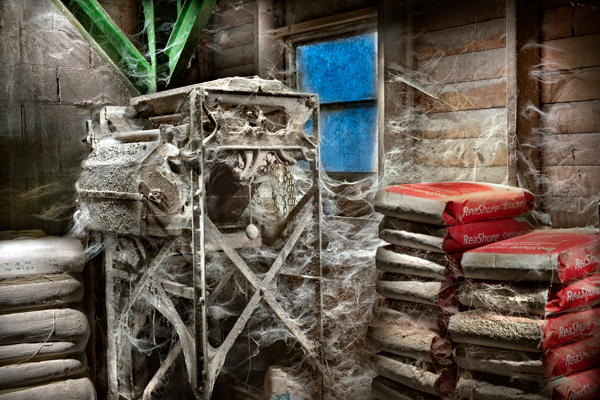 I light painted this with an off camera flash trying to bring out the webs and dust and dirt as best I could. At least no mice ran by me on this visit. I have no idea what the machine does but it must not get used very often. This is an old roller mill that I came across while wandering the back roads this past weekend. I started the afternoon off heading to play volleyball but I took my camera gear along in case no one showed. Well no one showed, so I cruised around and came across this locale. I was all excited as Amish buggies, open carts etc were all around the area. I pull in here and realize my tripod is 15 miles away at home.So I head home disgusted with myself and decide to return in the evening. Four hours later I come back and set my gear up on my truck roof to get a better view and I wait almost an hour till these three buggies come by. After they passed, I sat there till dark and not one more buggy came by. If I could somehow get up another 8 ft or so, you could see the entire covered bridge,which is just in sight on the edge of the right side. This evening was a real feast or famine night for shooting, and since I am not the most patient individual, it was driving me crazy missing other opportunities. The late evening light was skimming in nicely, so maybe the delay was worth it. the thumbnail shows my roof setup and laptop inside and it all depends how much height I need, and in this case just a little. 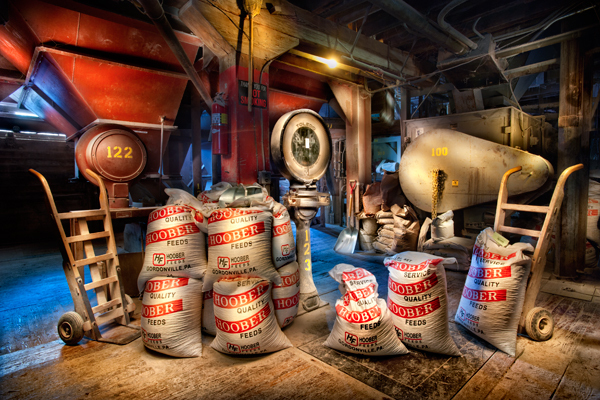 This image was taken at the feed mill that I had photographed and featured on my blog a few days ago. I met Brad the owner, and he graciously allowed both myself and fellow photographer Larry the chance to look around inside. After the mill shut down for the day, we broke out our gear and we each selected an area to light paint. Admittedly it has been a while since I gave this technique a try, so I struggled a bit as I worked to light the room with my spotlight. The mill is a real labyrinth of metal and wood, and left me wondering how such a place is designed. The inside also included numerous cats roaming about, which surprised me with all the machines at work, but after I had witnessed a cat catch a mouse three feet in front of me, it all became clear very quickly. The area I chose included the old scale with the two feed bags on it, along with another scale facing the opposite direction with the number 122 on it. The blue light is coming from window light that was shining in at dusk. 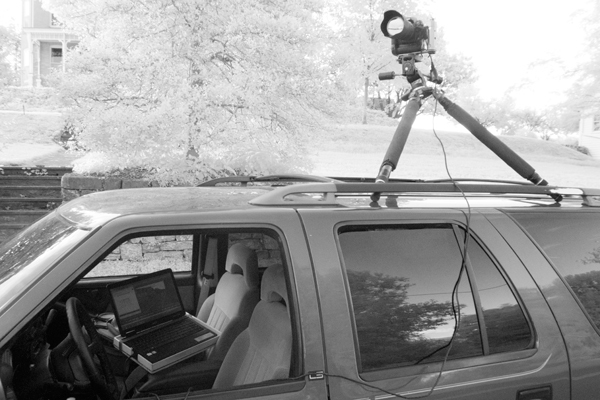 We usually work in the dark, but time constraints had us shooting earlier. 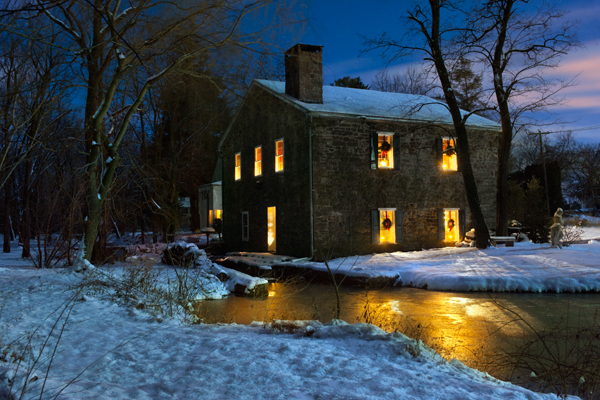 This is the same mill I posted a few days ago,but this time I lit the scene with my spotlight at dusk. I was out shooting in the area and decided at the last-minute to give the location a test try with the light. My light was low on battery power, so I did not get as much use out of it as I had hoped, but it was a good chance to practice a bit. 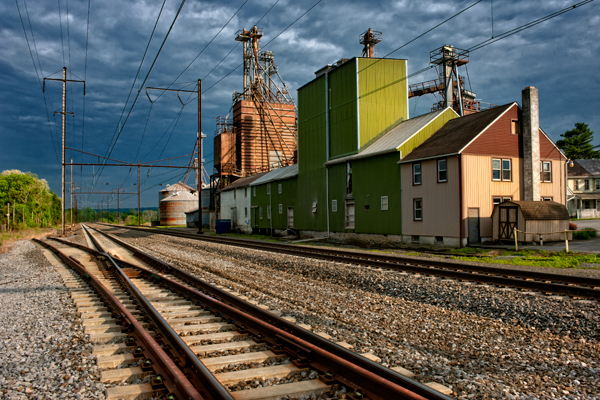 This image was taken minutes after yesterday’s post, and shows the mill from the train tracks side. The sky was totally cloud covered and yet I was fortunate enough to be in the right spot when a few rays broke through to skim across the shot. lasted about a minute, which was all I needed. As a side note, I knew this was an active line, but did not realize the train comes through doing about 60 mph plus. I no sooner had picked up my tripod and walked across the tracks when I heard a whistle up toward the trees to the left and when that train came through it was hauling. I thought to myself how unnerving it must be to drive that thing and see something or someone on the tracks ahead and know you are helpless to stop it in time.